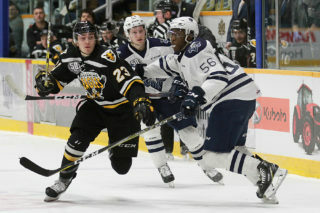 A two game winning streak came to an end for the Screaming Eagles Thursday night in a 5-1 loss to the Blainville-Boisbriand Armada. The first five minutes proved to be key for the Armada with two goals scored in similar fashion. Former Eagle Peyton Hoyt opened the scoring a with tip that redirected a Samuel Desgroseilliers shot at the 4:10 mark. 28 seconds later Antoine Demers scored a similar goal, and Marc-André Dumont would call a timeout to settle his team down. Kyle Havlena would also try to spark the Screaming Eagles, dropping the gloves against Anthony Poulin. Both players would get in their fare of shots before being being separated by the linesmen. Momentum did seem to shift towards to the home team following the timeout and fight, as both Adam McCormick and Leon Gawanke would both generate scoring chances for the Eagles, with Gawanke ringing one off the bar. The play went down the other end but the Eagles were able to clear the puck, and Declan Smith would come up the wing and rip one over Emile Samson to put the home team on the board. The first period would end up with the Armada up 2-1. All the offense in the middle period would belong to the visitors. Alexander Katerinakis would find himself in front of the net and put it over Kevin Mandolese at 9:23 of the second period. But not long after the Armada would find themselves in penalty trouble, as Rémy Anglehart took a five minute major for checking from behind. Blainville-Boisbriand did not allow the Eagles much in the way of entry on the power play, but in the final minutes of the man advantage Brooklyn Kalmikov generated a few quality chances, one of which hit the iron. 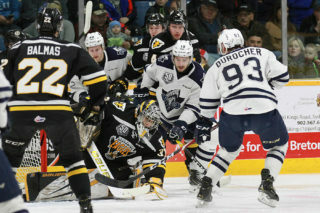 The Eagles were not able to score on the power play thought, and the Armada would strike shorthanded as Charles-Antoine Giguère put it through the legs of Mandolese to make it a 4-1 game. 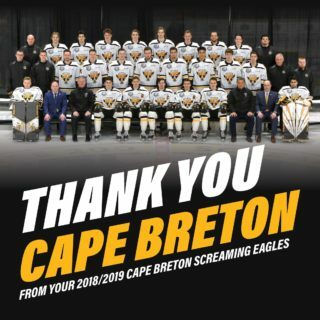 It would spell the end of the night for the Eagles goaltender as William Grimard came in in relief. There was not much of the way off offensive opportunity on either side in the final frame, as the Eagles outshot the Armada 7-5. 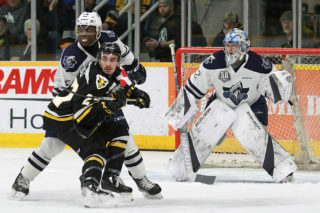 There was one goal though as Giguère would convert a cross-crease pass from Katerinakis to beat Grimard and finish the scoring for the evening. Samson stopped 25 of 26 shots in picking up the win. Mandolese allowed four goals on 14 shots in taking the loss, before Grimard stopped seven of eight shots in relief.